Dempsey, Guy C. Napoleon’s Mercenaries: Foreign Units in the French Army under the Consulate and Empire 1799 to 1814 London: Greenhill Books; 2002. 351 pages. ISBN# 1853674885. $50. Hardcover. Finding information on the numerous French cavalry and infantry regiments is fairly simple to do. Many books have been written on them, their exploits, and their uniforms. Yet little can be found on the foreign units that were an integral part of the French army. By January 1812, over 100,000 foreigners were serving in the French army and consisted of 13% of its total infantry. Try finding information on Croatians or the Illyrians. It is not easy. Usually it can only be found in the most specialized work. For a long time a gap has existed, but now Napoleon’s Mercenaries fills this gap. Guy Dempsey examines over 100 different foreign units that served in the French Army. To qualify to be included in the book, the unit had to be recruited from locations that were not part of France, paid for by the French government, and fought under a French flag. These qualifications excluded many of the more colorful units that fought with the French during the era, because most were part of a national contingent that were provided as part of a treaty obligation – such as the regiments from Bavaria, Westphalia, or the Confederation of the Rhine. Some of the units, such as the Chasseurs-a-Cheval Aragonais, have only a half page entry, but many of the more famous ones have numerous pages. The entry for the Régiment de Prusse has nine pages, while there are over 30 pages for the Swiss infantry regiments. Mr. Dempsey brings the human element into the descriptions by quoting extensively from memoirs of officers and men who served in the units. The author has done a masterful job of compiling the data from numerous sources. He cites his sources and when he has no information on a certain area, he states so. 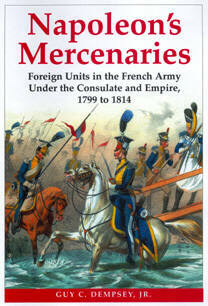 Napoleon’s Mercenaries is not only a great reference book, but also a great read. It is packed with useful information, but also with fascinating trivia. The reader will find that once he starts thumbing through it, he will have a hard time putting it down.